Ok so definitely not as picturesque as London but it will have to do! I've been really struggling to find shoot locations in my town. I think i may have to arrange frequent trips to the city to shoot my outfits haha. I've had this trench coat for a year or more now but Zara always bring out different varieties of it, so i wanted to feature it on the blog anyway as i absolutely love it. I've been wearing it so much recently as it's the perfect thickness to wear with jumpers and it just makes every outfit look a little more smart. I went for all monochrome so that the coat would really stand out, but then i couldn't resist throwing on my Tartan bag which really helped to tie everything together due to the gold hardware and black leather. Red just seems to go so well with this Trench Coat too, surprisingly! 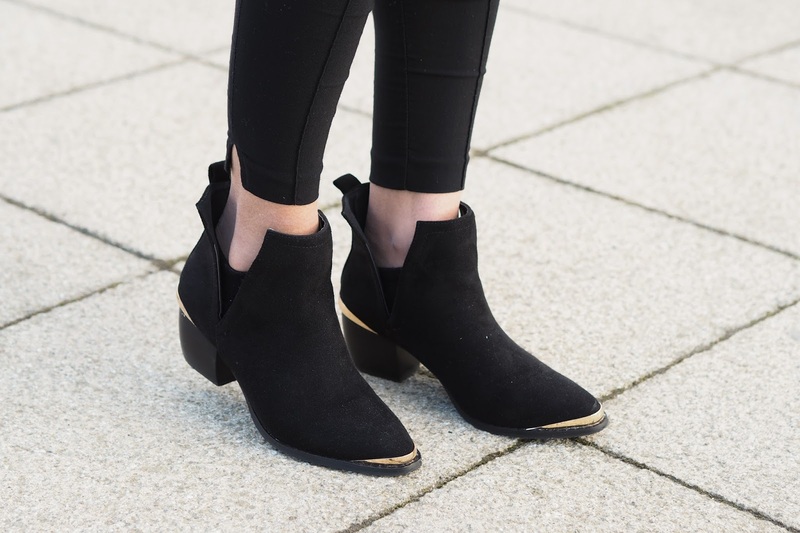 These boots are a new addition from Asos, i just had to pick them up as the cutout sides really intrigued me and i just had to see if they actually stay on your feet properly. Luckily they do, and they're actually really comfortable. Another thing i'm obsessed with lately is tight thin knit jumpers. This colour block one is from Topshop, i like it because it helps to break up the outfit a little whereas i think an all black jumper would be boring, and an all white jumper would be too much. I've got a few on my wishlist at the moment including this one from Karen Millen and this cashmere one from John Lewis.